(a) Turn the crankshaft, and bring each piston to top dead center (TDC). Using a gasket scraper, remove all the carbon from the piston top surface. (b) Using a gasket scraper, remove all the gasket material from the cylinder block surface. (c) Using compressed air, blow carbon and oil from the bolt holes. CAUTION: Protect your eyes when using high pressure compressed air. Using a gasket scraper, remove all the gasket material from the cylinder block contact surface. NOTICE: Be careful not to scratch the cylinder block contact surface. Using a wire brush, remove all the carbon from the combustion chambers. Using a valve guide bushing brush and solvent, clean all the guide bushings. Using a soft brush and solvent, thoroughly clean the cylinder head. Using a precision straight edge and a feeler gauge, measure the surfaces contacting the cylinder block and the manifolds for a warp. If the warp is greater than maximum, replace the cylinder head. Using a dye penetrate, check the combustion chamber, the intake ports, the exhaust ports and the cylinder head surface for cracks. 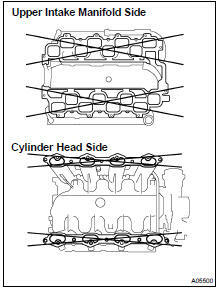 If there is a crack, replace the cylinder head. (a) Using a gasket scraper, chip off any carbon from the valve head. (b) Using a wire brush, thoroughly clean the valve. (a) Using a caliper gauge, measure the inside diameter of the guide bushing. (c) Subtract the valve stem diameter measurement from the guide bushing inside diameter measurement. (a) Grind the valve enough to remove pits and carbon. (b) Check that the valve is ground to the correct valve face angle. (d) Check the valve overall length. (e) Check the surface of the valve stem tip for wear. If the valve stem tip is worn, resurface the tip with a grinder or replace the valve. NOTICE: Do not grind off to below the minimum. (a) Using a 45 carbide cutter, resurface the valve seats. Remove just enough metal to clean the seats. (b) Check the valve seating position. Apply a light coat of prussian blue (or white lead) to the valve face. Lightly press the valve against the seat. Do not rotate valve. If blue appears 360 around the face, the valve is concentric. If not, replace the valve. If blue appears 360 around the valve seat, the guide and face are concentric. If not, resurface the seat. If the seating is too high on the valve face, use 30 and 45 cutters to correct the seat. If the seating is too low on the valve face, use 60 and 45 cutters to correct the seat. (d) Hand-lap the valve and valve seat with an abrasive compound. (e) After hand-lapping, clean the valve and valve seat. (a) Using a steel square, measure the deviation of the valve spring. (b) Using vernier calipers, measure the free length of the valve spring. (c) Using a spring tester, measure the tension of the valve spring at the installed length. (a) Place the camshaft on V-blocks. (b) Using a dial indicator, measure the circle runout at the center journal. If the cam lobe height is less than the minimum, replace the camshaft. Using a micrometer, measure the journal diameter. If the journal diameter is not as specified, check the oil clearance. Using vernier calipers, measure the free distance between the spring ends. If the free distance is not as specified, replace the gear spring. Check that bearings for flaking and scoring. If the bearings are damaged, replace the bearing caps and cylinder head as a set. (a) Clean the bearing caps and the camshaft journals. 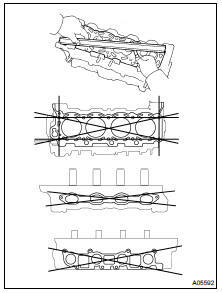 (c) Lay a strip of plastigage across each of the camshaft journals. If the oil clearance is greater than the maximum, replace the camshaft. If necessary, replace the bearing caps and cylinder head as a set. (g) Completely remove the plastigage. (b) Using a dial indicator, measure the thrust clearance as moving the camshaft back and forth. If the thrust clearance is greater than the maximum, replace the camshaft. If necessary, replace the bearing caps and cylinder head as a set. (a) Install the camshafts without installing the exhaust cam sub-gear and the front bearing cap. (b) Using a dial indicator, measure the backlash. (b) Using a micrometer, measure the lifter diameter at the valve lifter center line, 12.3 - 12.7 mm (0.484 - 0.500 in.) from the valve lifter head. (c) Subtract the lifter diameter from the lifter bore diameter. (a) Upper intake manifold: Using a precision straight edge and a feeler gauge, measure the surface contacting of the lower intake manifold for a warp. If the warp is greater than the maximum, replace the upper intake manifold. (b) Lower intake manifold: Using a precision straight edge and a feeler gauge, measure the surface contacting of the cylinder head and the upper intake manifold for a warpage. If the warp is greater than the maximum, replace the lower intake manifold. Using a precision straight edge and a feeler gauge, measure the surface contacting of the cylinder head for a warp. If the warp is greater than the maximum, replace the manifold. Using vernier calipers, measure the thread outside diameter of the bolt.